Donald Taylor (right) with colleagues Mike Disney (left) and John Cocke (center) in 1969, shortly after reporting their discovery of an optical pulsar. The beams of light registered on Jan. 15, 1969, celestial winks from the heart of a cosmic crab. Days earlier, a future University of Nebraska-Lincoln professor had equipped two young acquaintances with the tools to beat astronomical odds and first observe the light of a pulsar. 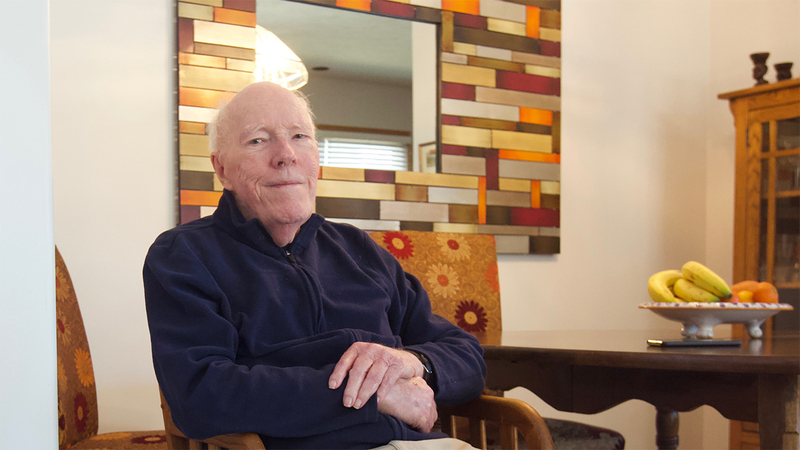 That future Husker was Donald Taylor, who would settle in Lincoln two years after the career-defining discovery of an optical pulsar: a rapidly rotating, radiation-spewing star whose light can be detected from Earth. Situated at the center of the Crab Nebula, the 12-mile-wide pulsar was first detected via radio waves in late 1968. Its discovery set off a massive hunt for others – and a race to record their light. Yet at the time, many astronomers remained skeptical of ever detecting light from a pulsar. Measurements of the Crab pulsar’s radio waves had indicated that it rotated 30 times per second, meaning that the Earth would glimpse any light emissions for a mere 1/30th of a second – roughly 10 times shorter than the blink of an eye. With Taylor’s technical ingenuity guiding the impromptu team, that was long enough. When John Cocke and Mike Disney arrived at the University of Arizona, strangers to Taylor and one another, they were simply hoping to get experience with a telescope at the university’s Steward Observatory. Unlike many of the astronomers in their midst, Cocke and Disney were theorists, far more familiar with the mathematics of astronomy than the ongoing search for its phenomena. Still, with the buzz of the 1968 pulsar discovery reverberating through observatories worldwide, the pair decided to aim for the stars. 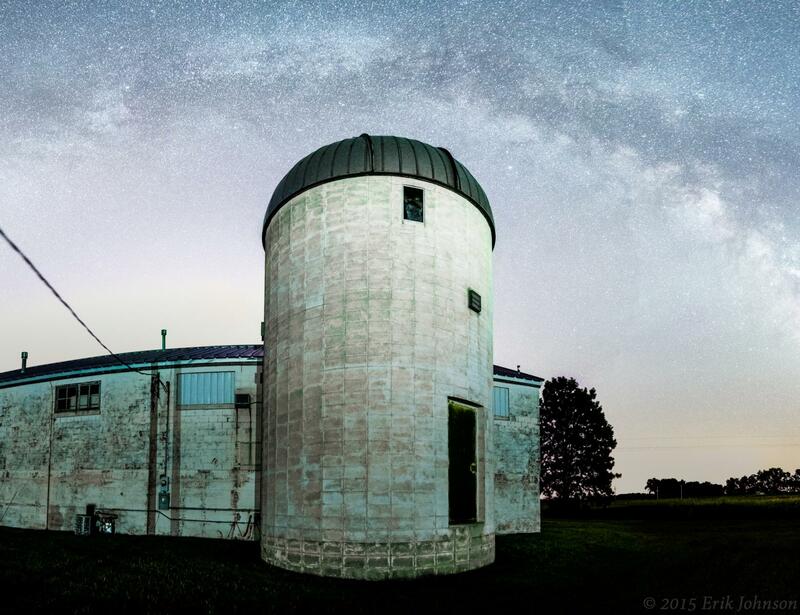 One of the observatory’s senior astronomers, Ray Weymann, suggested they reach out to Taylor. 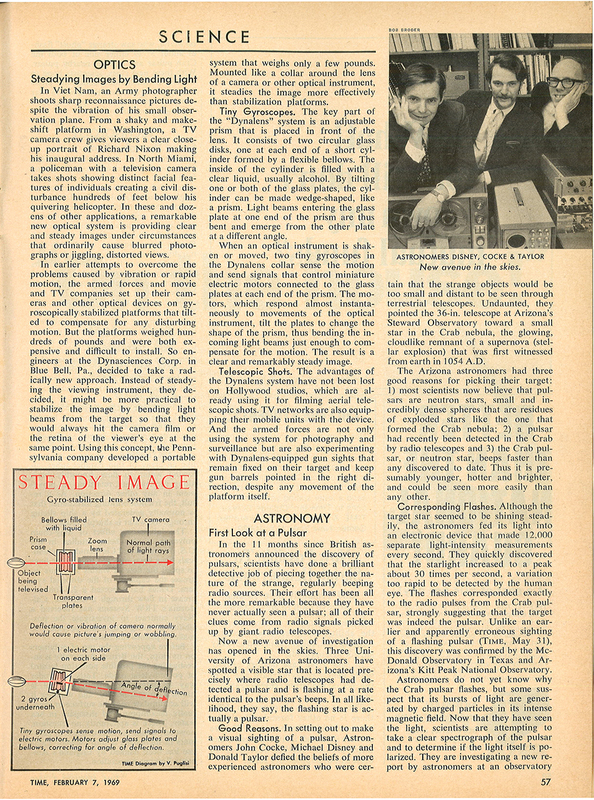 “So we decided to go in with Don Taylor, which was a hell of a good thing,” said Disney, who called Taylor an “electronic wizard” in an oral history from the American Institute of Physics. Equipped with an outdated 36-inch telescope – an afterthought compared with the observatory’s newer 200-inch model – Taylor figured the trio’s prospects of detecting a pulsar’s light were fainter even than the star they sought. But he admired the young scientists’ audacity. Taylor’s own interests lay with planets and quasars – which, as it turned out, made him well-suited to looking for an optical pulsar. His search for those similarly faint celestial bodies often involved a technique called area scanning. As part of that technique, Taylor would place a vertical slit over a telescope’s field of view and pan it across a portion of the sky. When the slit panned past a light source, the amount of light entering it would fluctuate: very little at first, then a fair amount, then very little again. Plotted on a graph, these values formed a light curve that could help identify a planet or quasar. Taylor realized that a pulsar’s rotation effectively acted like the panning motion. If the slit were trained on a pulsar, the star’s emission would move across the field of view like a lighthouse, producing a similar curve. But the faintness of such signatures, combined with distortions from Earth’s atmosphere, resulted in noisy signals and jagged curves. So Taylor connected the 36-inch telescope to a Computer of Average Transients, or CAT, that could average many passes of light into a smoother, more representative curve. 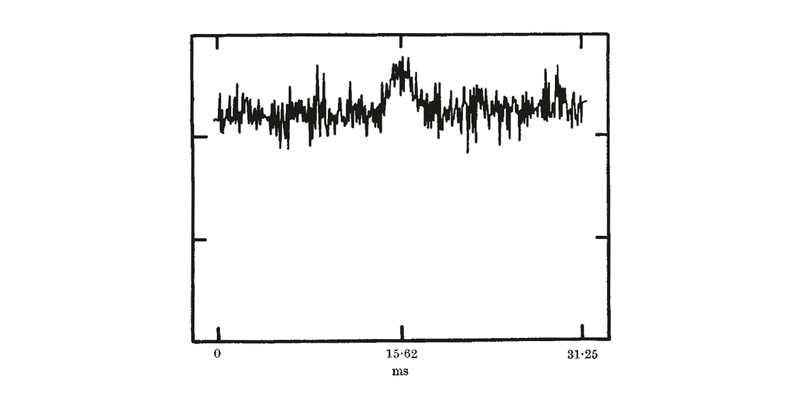 Knowing the duration of the Crab pulsar’s pulses – 1/30th of a second – also allowed him to calibrate the search for repeating flashes lasting exactly that long. After attaching a pulse amplifier and training the telescope on the Crab Nebula, the astronomers were ready to seek the pulsar’s light. For several nights, in the frigid darkness of the Steward Observatory, the team found nothing. Taylor, intent on helping his students prepare for upcoming exams, returned to campus as Cocke and Disney continued the hunt. A few nights later, Taylor’s phone rang. It was Disney. “‘They don’t know what they’re doing.’ That was my reaction,” he said with a laugh. “They weren’t familiar with the equipment. Theorists tend to do their science mathematically, and they were good at that, so I knew they were smart enough. But they hadn’t had the experience. Seeing was believing for Taylor, who returned to the observatory the next day. Sure enough, green dots rose and then fell across the small monitor of the CAT, tracing the telltale arc of a light curve. Assured of its discovery, the team sent a telegram off to the International Astronomical Union. On Feb. 8, 1969, Cocke, Disney and Taylor officially announced their findings in the journal Nature: “Strong light flashes have been detected from the fast pulsar in the Crab Nebula.” To date, the Crab pulsar ranks as the first of just a handful observed in the visible spectrum. An article detailing the trio's discovery in the Feb. 7, 1969, edition of Time magazine. The trio’s partnership eventually helped guide Taylor to the University of Nebraska-Lincoln. In 1970, Cocke’s friend Kam-Ching Leung arrived at Nebraska to revitalize its dormant astronomy curriculum. When Taylor began itching for a move, Leung suggested Lincoln. Taylor joined the faculty in 1971 and stayed on until his retirement in 1998. During that time, he oversaw multiple projects that have come to define the study and practice of astronomy throughout the state. Not long after setting foot on campus, Taylor developed specifications for the 30-inch reflecting telescope that was installed at the Behlen Observatory in 1972. He later helped install the solar-viewing Minnich Telescope and secured funding for the Student Observatory that sits atop the Memorial Stadium Garage.